McCain's fight for Pennsylvania may not pay off. (CNN) - John McCain's campaign is banking its fortunes on a come-from-behind win in Pennsylvania, but a new CNN poll of polls of the Keystone state suggests the Arizona senator has made little progress there over the last week. According to a statistical average of several recent Pennsylvania polls, Barack Obama holds a 10 point advantage over the Arizona senator, 52-42 percent. That's the same lead Obama held over McCain in a poll of polls of the state last week. With traditional red states such as Virginia and Colorado looking increasingly out of reach for McCain, aides to the Arizona senator have all but said Pennsylvania's 21 electoral votes are a must-win to keep Republican hopes of a White House win alive. Both McCain and Palin have held several campaign events in the state over the last week as Election Day inches closer, and the campaign has continued to heavily advertise on television there, even as it pares back spending in other states. Meanwhile, a new CNN poll of polls out of Florida - another must-win state for McCain - shows the race there remains essentially a dead heat. Obama holds a single point advantage there, and recent polls suggest the race is tightening slightly. A poll of polls of the state last week showed Obama ahead by 3 points. For those tthat can, EARLY VOTE. I waited in line for a hour and the lines are getting longer....For those voting for the RIGHT candidate, we can't afford to be lax...Get out there and give President Obama his LANDSLIDE !!!!!!! I also watch some of both speeches. They were very different. Obama was up beat and postitive. He said what he will do as President. Mccain tried to scare me in not voting for Obama. No reasons why I should vote for him. I must admit, I've been scared in not voting for the other guy in past elections, NOT THIS TIME! God help this country if Obama is elected! Pennsylvanians are not stupid. They don't hunger for four more years of the same old bad-tasting Bushonomics for the rich. McCain, you're wasting your time! I live in Pa, and the amount of ads that McCain is running here and the negative tone, or the fact that the claims have been prioven false is what he is banking on. Obama's ads are positive, saying get out and vote.. I am tired of mcCain and his negative tone, he ahs nto said what he will do , offered any plan...he has been ebhind in everything and if he is claiming to be a leader look at the disaray of his campaign,...if he cannot lead that how can he lead the nation. I have been a republican all my life, but my wife and I are voting for obama/biden, we are tired of the negative tone of the republicans and will not give them our votes. McCain needs to GET OUT OF PA !!!!!!!!! Use his money into maintaining down ticket candidates in Indiana, Georgia, Missouri, North Carolina, and Florida. Everyday in Pa costs his Campaign LOTS OF MONEY that they DO NOT HAVE. He needs to change his tactics to maintain some dignity for what is left of the Republican Party. Bush has cost them enough.....McCain needs to stop the bleeding if INDEED he is a Party Person. Well, It's time for McCain's big "October Surprise". This morning, McCain called for Alaska Senator Ted Stevens to step down after his fraud conviction. So, Stevens steps down, leaving Alaska Gov. Palin the responsibility to choose a successor. So, Palin quits the losing McCain campaign (that she isn't happy with anyway) and, to no one's suprprise, appoints herself Senator for Alaska. Palin goes home to launch her write-in campaign to keep the Senate seat (at least she'll be able to call her own shots in that campaign). 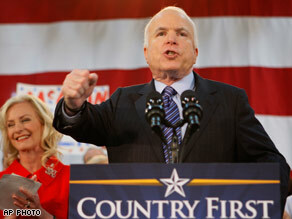 McCain then names former Pennsylvania Gov. Tom Ridge as his new, October Surprise Vice-President, because he's desparate to win PA! Then, in true McCain form, he lies to everybody (again) and says that this was his plan all along!!! Somebady check real quick – Did Stevens call for McCain to resign during the Keating scandal????? barack obama's speech, today: UNITE! UNITE! UNITE! john mccain's speech, today: FIGHT! FIGHT! FIGHT! who do you trust to bring this divided nation together? No wonder the polar ice cap is melting,,,,,,,,Sarah Palin's hot air is destroying it,,,,,,,,thankfully her hot air is also destroying Senator McCain,,,,,,,not that his hot air has not helped destroy himself. Obama will win Pennsylvania, we are not blinded by McSames fruitless attacks and dumb speeches delivered by the woman that doesn't deserve to be where she is. We are proud people in Pennsylvania and will do the right thing for an undivided America: Vote for Change! All I can say is WOE to America if this man OBAMA who is so full of graft (REZKO, WRIGHT, PLEGHER, TERRIOST, DONATIONS TO REGISTRATION FRAUD ORGANIZATION) gains the White House. With the majority in the House and the Senate we will be a third world country in three years. REMEMBER AMERICA YOU HAVE DONE IT TO YOURSELF OVER THE PAST EIGHT YEARS WHEN I SAID IT WAS WRONG TO PUT BUSH IN THE OVAL OFFICE JUST THE SAME AS I AM TELLING YOU NOW YOU ARE FOLLOWING UP WITH A TOTALLY WORSE PERSON. Thank you CNN for the biasness! Its because of you, I will vote McCain. A LOSER FROM THE BEGINING!!!! Now is not the time to get complacent or over confident. Get the vote out for Obama on November 4th. You know I am so tired of people saying we should be afraid of what may happen if Obama is elected. Why? Because he is an African American? Please! The GOP has strategically tried to divide this nation, and it's so sad. The only thing that is different about African Americans, Whites, Asians, and Hispanics is our skin color and culture. We should be asking ourselves why did it take so long for us to potential have an African American President. We need more representations of diversity in this country!